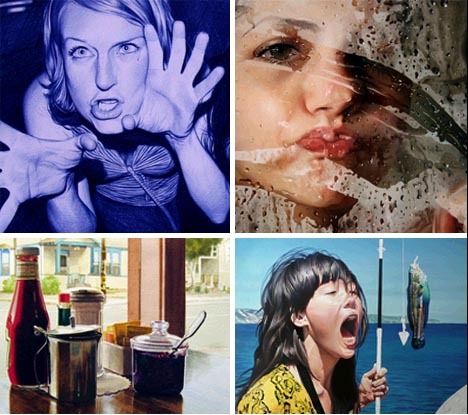 Amazingly, none of these beautiful pieces of art are photographs. 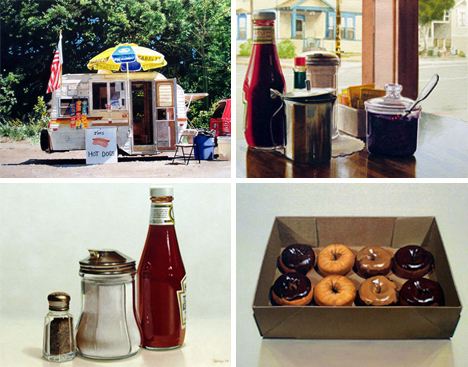 They were all made with various methods, but all of them are part of the photorealism genre. The movement got its start in the US in the 1960s and 1970s, but since then, it’s taken on new forms. Some artists prefer to work in paints, some with computer graphics, and some use materials that are a little more unusual. Whatever media they use, these 10 artists elevate photorealism to new heights with their monumental talent. Believe it or not, these incredible pictures were all made with ballpoint pens. 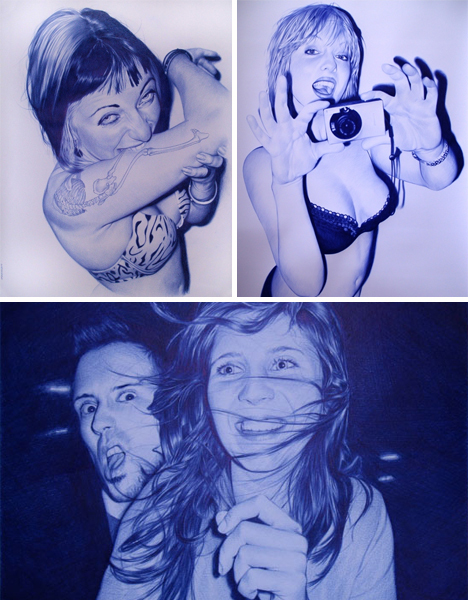 Juan Francisco Casas‘ ultra-realistic pen drawings have been causing double-takes all over the internet. 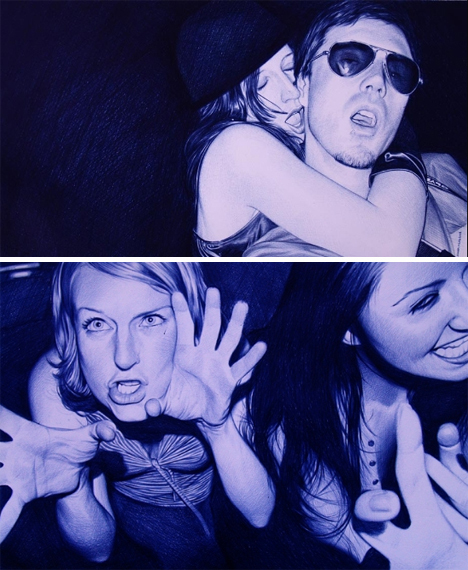 Casas works on huge canvases, using nothing more than a blue Bic pen to recreate candid photos of playful young people. The Spanish artist has exhibited his remarkable art all over the world. This particular painting has been surrounded by controversy and disbelief as it’s made its way around the internet. It’s so realistic and so finely detailed that many people had trouble believing it is, in fact, a painting. But Dru Blair, the artist responsible, is a well-known photo-realistic artist. He began the piece for a class, but finished it later on his own. His amazing airbrush art has been featured in hundreds of advertisements, magazines and book covers. Aviation art is a favorite subject for the artist, and his first aviation painting, “Power,” is the highest selling aviation print in the world. If you’re interested in learning this style, Dru Blair runs the Blair School of Art in Blair, South Carolina. 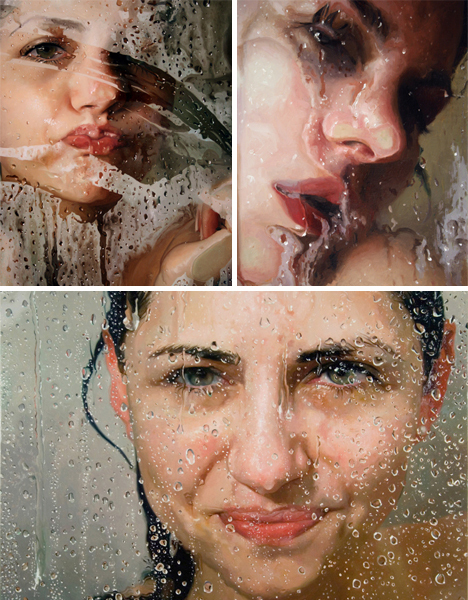 Alyssa Monks describes her work as portraying “simultaneous empathy and detachment,” which seems an accurate assessment. Her incredibly detailed oil paintings usually show unguarded moments, but with a certain amount of distance. 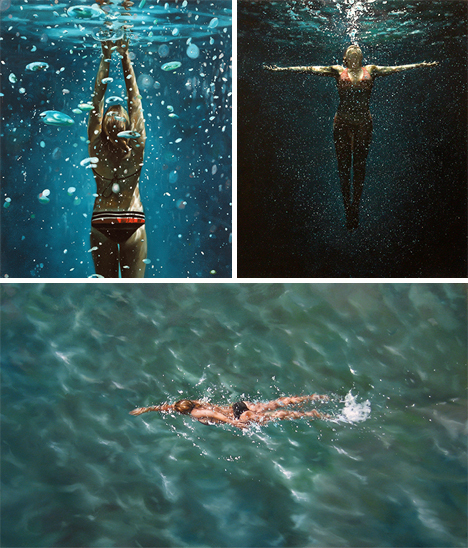 Much of her work features water, which she renders perfectly. Monks is currently an instructor at both Montclair State University and and the New York Academy of Art. After spending 20 years in the advertising industry, Bert Monroy ventured into digital art on his own. 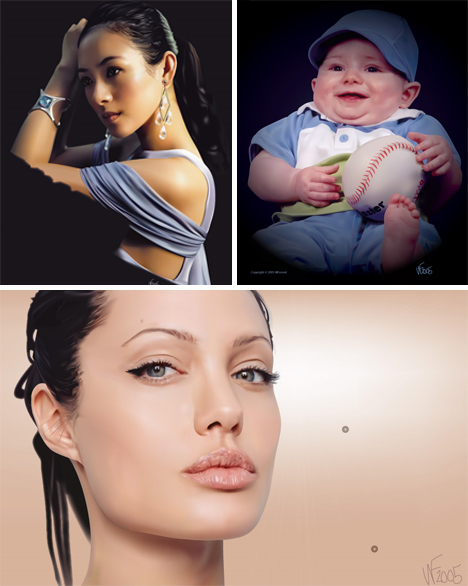 He has used pretty much every commercially available digital art program to experiment and create some unbelievably realistic pieces. When asked why he creates photo-realistic images rather than just, say, taking a picture, Monroy points out that the process is what thrills him, not necessarily the final product. Bert Monroy is an accomplished teacher, writer and lecturer, and part of the Photoshop Hall of Fame. Eric Zener creates worlds of gentle escapism, both for himself and for the viewer. While they do show very deliberate moments in time, they are infused with the temporarily carefree attitude we adopt when swimming, lazing in the sun, or simply resting for a moment. What’s even more incredible is that Zener’s art is created not with a camera, but with paint. The painstaking detail he puts into each and every painting perfectly balances the sweet, airy nature of the subjects. David Kassan‘s life-size paintings set the soft and vulnerable human form against gritty urban backgrounds to create images that are, according to the artist, both real and abstract. Kassan combines a tender look at the subject with a detachment that allows the viewer to make up their own mind about both the subject and the image as a whole. Though he cites many realists as inspiration, Kassan’s work has a singular aching beauty that is all his own. Is there beauty in a crusty old ketchup bottle? What about a box of donuts or a tired old hot dog stand? Ralph Goings has been finding the beauty in everyday objects for more than 40 years. 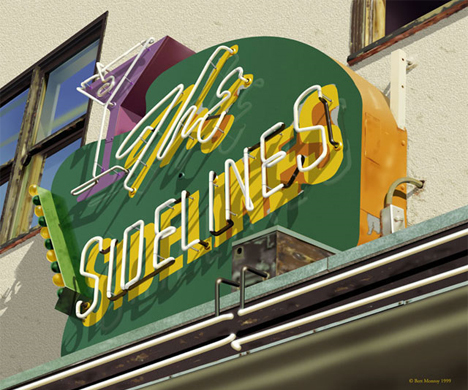 His unique brand of realism puts mundane objects into an extraordinary light by highlighting their every curve and corner, and examining the way the light plays on their surfaces. 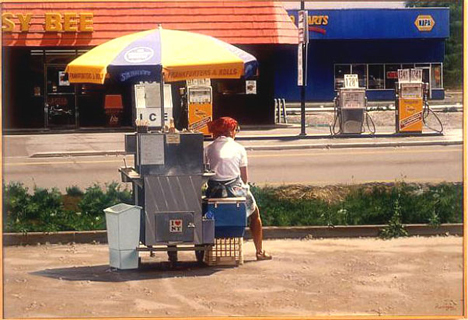 When Goings joined the photorealism movement of the 1960s and 1970s, he was pleased to note how much his art seemed to disturb some people who didn’t believe that his exceptionally realistic paintings were really art. Wayne Forrest, known to the DeviantArt community as GMesh, turns to the internet for inspiration. When he sees an image that catches his eye, he recreates it himself using programs like Illustrator, Photoshop, Premiere, Indesign, and Swift3D. Forrest began working with CG after his retirement from the Canadian military, and he has obviously dedicated himself to learning his art. 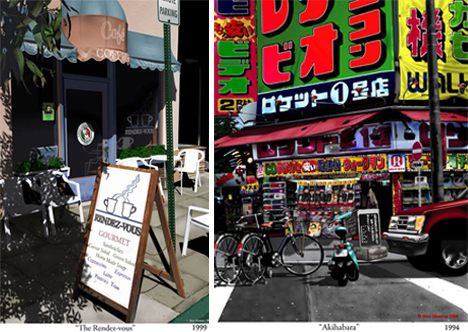 His digital paintings show the level of work he has put into learning all about computer graphics. 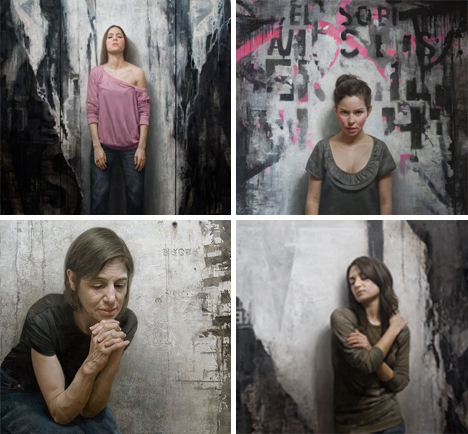 Diego Gravinese‘s work is breathtaking, and not only because of its realism. His work displays a gentle understanding of his subjects, an intimacy that is infused with playfulness. The series of three paintings above show the process the Argentinian artist went through to arrive at a spectacular end product. His oil and acrylic paintings are definitely not to be missed; down to every last detail, they portray a level of care and amazing skill that are hard to find in modern painters. Though he doesn’t work in paint or computer graphics, Adam Beane‘s work most definitely deserves a mention. 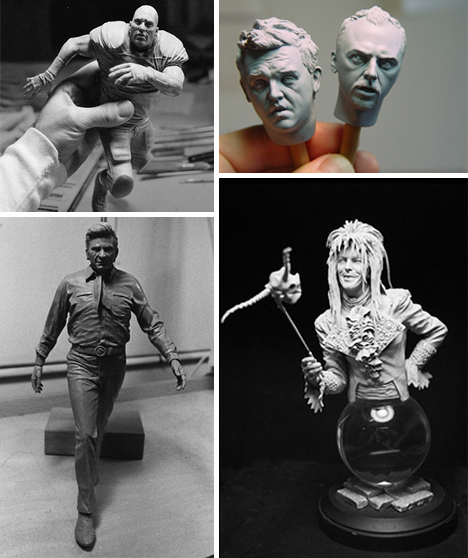 The commercial sculptor uses his talents to create eerily realistic tiny versions of famous people, which are then used to make action figures. Looking at photographs of the unpainted sculptures in Beane’s hand feels like looking at creepy Photoshop jobs with Beane acting as the hand of God. 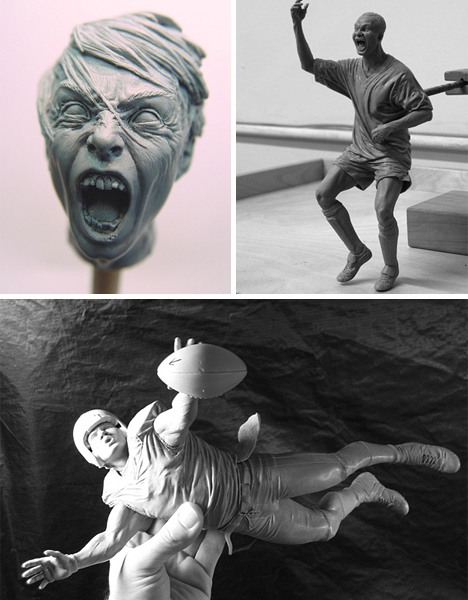 What’s most amazing about his work is that he’s only been sculpting since 2002.